Be the first to share your favorite memory, photo or story of Russ. This memorial page is dedicated for family, friends and future generations to celebrate the life of their loved one. ROCKVILLE-Russ Campbell, 74, of Rockville, Indiana passed away Wednesday, November 14, 2018 at Gibson Family Center for Hospice Care in Terre Haute. He was a retired teacher and coach for Rockville High School. He was born in Oakland City, Indiana to the late Howard Campbell and Alletha Willis Campbell. Survivors include his wife of 39 years, Rosann Scott Campbell whom he married October 27, 1979 in Rockville; also surviving, one daughter, Robin (Jim) White of Rosedale; one sister, Fran Stevens-Reed of Greencastle; one brother, David Campbell of Sanford, Florida; four grandchildren, Amy (Les) Smith of Ozark, Missouri, Brian Campbell of Lebanon, Missouri, Shelby White of Rosedale and Lindsey White of Rosedale; one great-granddaughter, Tori Smith of Ozark, Missouri; several nieces and nephews. He was preceded in death by his son, Kelly Campbell. He was a graduate of Oakland City College and received his masters in physics at Ball State University. He was a member of the Rockville Christian Church and served on the Parke County Golf Course board. 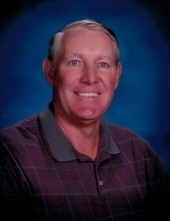 He was a varsity coach for football, basketball, tennis and golf. He had a passion for reading, education, athletics and always enjoyed a good discussion on any topic. Services will be 11:00 am Monday, November 19, at Rockville Christian Church, 292 W. US Highway 36, Rockville. Burial will be at Calvary Cemetery in Terre Haute at a later date. Visitation is 2-6 pm Sunday at Gooch Funeral Home, 112 W. Howard Street, Rockville. Memorials should friends so desire, may be made to Rockville Christian Church, 292 W. US Highway 36, Rockville, IN 47872 or Parke Heritage High School Golf, 506 N. Beadle St., Rockville, IN 47872 or Parke County Golf Course 1640 US-41, Rockville, IN 47872 in his memory. To send flowers or a remembrance gift to the family of Russ Campbell, please visit our Tribute Store. "Email Address" would like to share the life celebration of Russ Campbell. Click on the "link" to go to share a favorite memory or leave a condolence message for the family.